WiT and WWC: Acronyms You Should Know - Enova International, Inc.
WiT, Enova’s burgeoning internal professional organization, stands for “Women in Technology.” Inspired by pioneers in computing such as Ada Lovelace and Grace Hopper and the recent popularity of books such as “Lean In: Women, Work, and the Will to Lead,” more and more women in technology are looking to connect with one another over shared interests and common challenges in the technology industry. 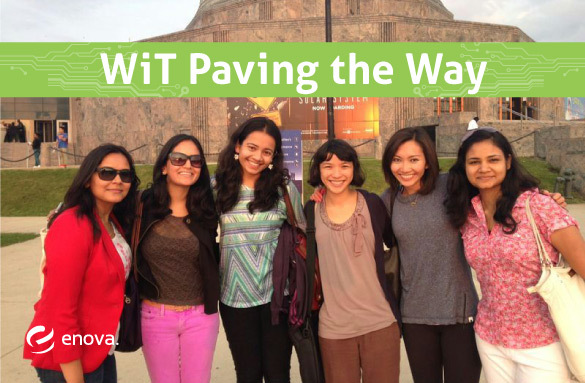 As a technology and analytics driven company employing more and more women in these fields, it has become increasingly important for women at Enova to collaborate, provide guidance, and share experiences in our day-to-day work lives; starting WiT was a natural first step. Our goal is to provide encouragement and exposure for the great things women are working on here at Enova, and to reach out as leaders in our community. Women Who Code (WWC) is one such community building organization that we’ve drawn inspiration from as we continue to develop the goals and vision for WiT here at Enova. Women Who Code is a global, non-profit organization dedicated to inspiring women in technology and helping them excel in their careers. Bringing together thousands of developers in chapters spread across fourteen countries, Women Who Code reaches out to anyone with a passion for coding, regardless of skill level. The organization offers technical study groups, hack nights, career workshops, mentorship, and hands-on instruction programs. Enovans Yumin Wong and Preeti Dhiman attended the first WWC meetup last week – a launch event held at Thoughtworks, with Jen Myers as the keynote speaker. Myers talked about her journey into programming, the challenges she faced, and how she overcame them. Our main takeaway? Women at any level can write excellent code. Here at Enova, WiT has been inspired by WWC and shares its values. In addition to continuing to represent Enova in the Women Who Code organization, we plan to offer, at the community level, similar professional development and networking opportunities. WiT’s first foray in building our organization here at Enova and with the broader community will be to sponsor a WWC hacknight on August 19th at Enova. The details are posted on meetup.com. In addition to hosting tech talks, discussions, and tutorials, we’ll be looking for new and interesting ways to support women in our field. Please contact us at wit@enova.com if you have any ideas you’d like to share with us!